Students typically say goodbye to each other for summer break, but for senior Danielle Simms ’18, the break was an opportunity to say hello to a new set of friends and a new city. 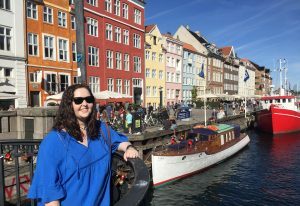 At the start of July, Simms embarked on a journey from her hometown of Chattanooga, TN to Copenhagen, Denmark for a five-week economics program along with 13 other Brandeis students. Yet, as the plane to Copenhagen crossed the Atlantic, Simms’ fears were left behind. The students, who Simms explained “wouldn’t really be friends with each other … at school,” began developing relationships that grew over the course of the summer, from time spent together in class, out on excursions in Denmark and even at local clubs and bars. There were two upper-level economics courses offered on the program, according to Simms: Behavioral Economics, taught by a local Danish Institute of Study Abroad (DIS) professor, and Money and Banking, taught by Brandeis professor Scott Redenius. While Simms enjoyed learning about the Danish culture, it was the Behavioral Economics class that stood out to her as a highlight of her academic experience. “We were a lot more hands on in the Behavioral Economics class. We would literally just stop in the middle of class and be like, ‘Okay now you guys are going to run this experiment. So go out in the street, and find people, and do it,’” Simms explained. One experiment run by the class examined whether strangers are more likely to help individuals whose behavior that stranger supports, explained Simms. To do this, the students ran two scenarios. In both scenarios, a student would yell at another student for littering. However, in Scenario A, the littering student would drop his books, and in Scenario B, the yelling student would drop his book. Were strangers more likely to help pick up the books of the littering or the non-littering student? “That was a hard one to do ourselves… we couldn’t keep a straight face half the time!” Simms explained that because the area they were conducting the experiment in was smaller, they had to wait to make sure there were new groups of strangers for each round. “We had to make sure people were not watching these kids just keep dropping things and yelling at each other,” said Simms. Although they were not able to collect enough data to confirm anything, the process of running the experiment was a good learning experience, said Simms. Though official experiments stopped when classes ended each day, Simms learned about the Danish culture by simply spending evenings out with her classmates, particularly at The Australian Bar, or “A Bar.” “It’s right next to where we have classes which is kind of funny, and you get in for free with a DIS student ID,” said Simms. “A Bar,” the first they went to as a group, ended up becoming the group’s go-to spot. “Everyone secretly liked it!” Simms said of the club. Though Simms enjoyed the program, she is excited to return to campus with more friends than she left it. 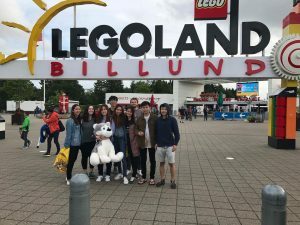 After visiting the Tivoli Gardens Amusement Park in Copenhagen and Denmark’s Legoland together, “we were talking about how we should go to Six Flags in New England,” said Simms of the group’s plan to continue spending time together. With two requirements for her economics major complete and memories from a fun summer abroad, Simms looks back on her summer in Copenhagen with fondness.